Hollywood struggles with inclusion, which we’ve seen play out in the Oscars the last few years. Sure, it’s just make-believe, not reality – but movies don’t just reflect our reality, they often create it. When people of every stripe and flavor are part of the ‘industry’, then the movies will show every stripe and flavor of person. Women, people of color and the LGBT community have all been vocal about the parts they want to play in Hollywood in recent years, with some success. 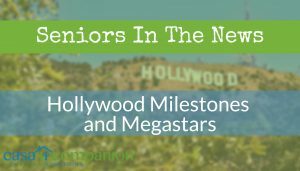 Sadly, there’s still one group that doesn’t get the right kind of attention they want from Hollywood: seniors. Until this year, when three octogenarians brought the silver to the Academy Awards! Caregivers, home care aides and seniors can all celebrate the oldest Oscar stars in history! If you follow the movies at all, the name James Ivory will surely ring a bell – a discreet bell in an old English manor. He was one half of the famous English team Merchant & Ivory, which made all those great costume dramas in the 1980s and 1990s. Together they slayed the Oscars for a decade with A Room With A View, Howards End, and Remains Of The Day. James Ivory was nominated for Best Director for each of these films, though he never won. Sadly, Ismail Merchant died in 2005, so their partnership came to an end. But this year, James Ivory won for Best Adapted Screenplay for Call Me By Your Name. He became the oldest winner of a ‘competitive’ Oscar ever, which doesn’t include the lifetime achievement Oscars that Hollywood’s elder statesmen are sometimes awarded. His win proves that at age 89, he’s still got it, and he’s beating writers half his age to get it! In fact, the last Oscar octogenarian, Agnes Varda, did win a lifetime achievement Oscar in 2017! She is also 89, and eight days older than James Ivory, which makes her the oldest Oscar nominee in history. Agnes began her career as a photojournalist in the 1950s and directed her first film in 1954. She was a pioneer of the Nouvelle Vague [https://en.wikipedia.org/wiki/French_New_Wave] and in 1977 started her own production company. For forty years, she’s been writing, directing, editing and independently producing the more than 50 films and documentaries in her catalog. Her nomination this year, for Best Documentary Feature, was for her film called Faces Places. She didn’t win, but she still stole the show in a silk Gucci trousers and robe ensemble with stack-heeled sneakers!